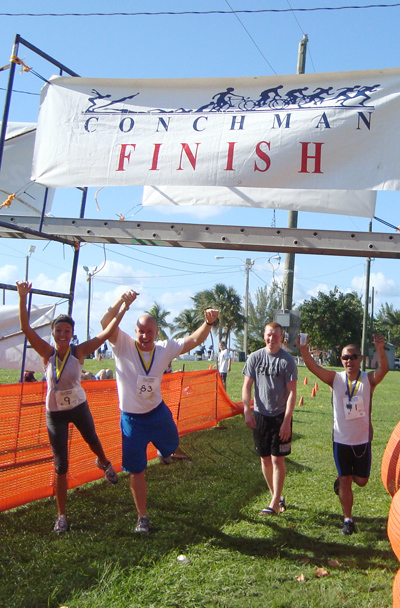 Freeport, Bahamas – DeVry Medical International’s (DMI) Medical Education Review Program (MERP) was pleased to sponsor the 25th Annual Conchman Triathlon and support fitness, wellness and healthy lifestyle activities in the Grand Bahama community. · Lukas Matthews won the 17-29 male age group. · Michael Cundiff received second place in the 17-29 male age group and the third-fastest run time overall. · Allison Matthews had the women's second fastest swim time, the fastest female run time (ninth overall) and was named the overall second fastest female. · Nicole Diol won the 17-29 female age group. · Ann Aro received second place in the 17-29 female age group. · Stephanie Holmsten received third place in the 30-39 female age group. Other MERP competitors who participated included Alvin Vong, Kody Nilson, Anudeep Pillarisetty, Jay Aro, Bao Le, Prestin Johnson, Nick Blackstone and Jon Holmsten. MERP commends Bert Bell, a coordinator for the triathlon, as well as all the organizers, volunteers and participants who helped make the annual event a success. MERP is a rigorous 15-week program designed to provide preparatory basic medical science course content for medical school education. Students who successfully complete MERP are offered entry to Ross University School of Medicine. DMI recently invested in an upgrade to the MERP facilities at Seahorse Plaza and maintains a longstanding relationship on the Grand Bahama Island. Many MERP students benefit from a wealth of experiences in Freeport as they often connect to the community through churches, outreach opportunities and by supporting the local economy. Allison Matthews, Lukas Matthews, Michael Cunduff and Alvin Vong recreate their fantastic finishes! Stephanie Holmsten (center) receives her trophy at the awards presentation at Port Lucaya Marketplace, Count Basie Square.